our white studio is such a great blank canvas. we were having an office party and wanted something super simple but impactful for the decorations. 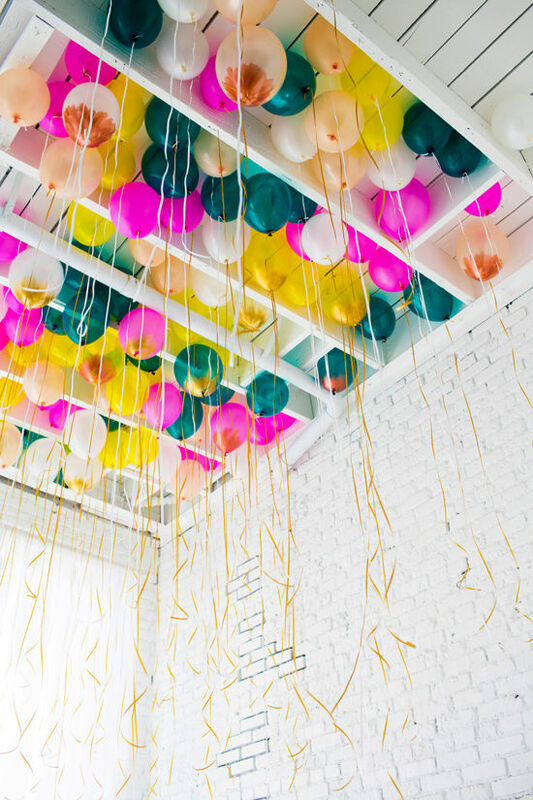 so why not fill the entire ceiling with colorful balloons? 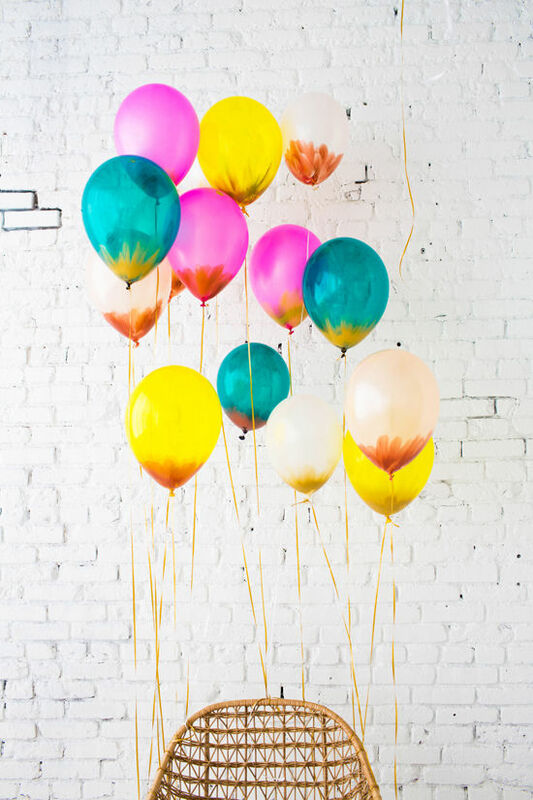 to add to the beauty, jesi added some pretty metallic brush strokes to random balloons, some gold and some copper. the studio felt like a dream and it was the perfect touch for the party. 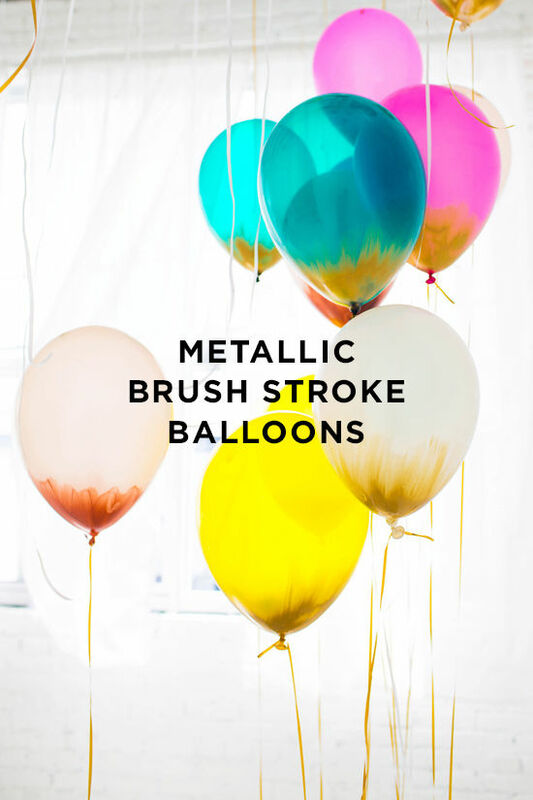 all you need is some metallic paint & a brush, balloons, and a helium tank. 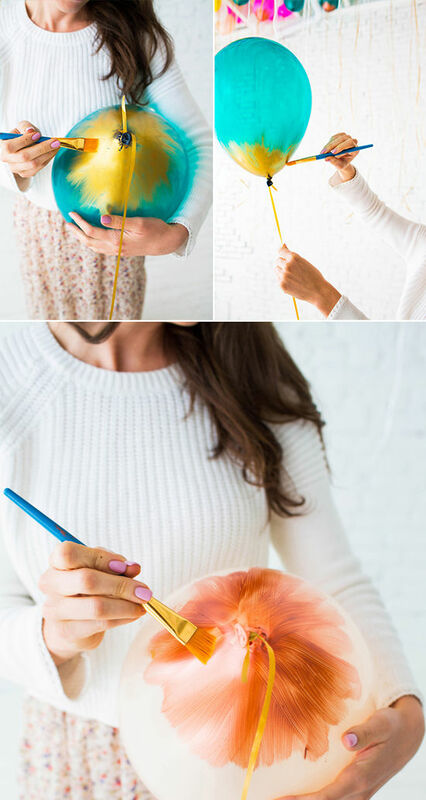 loosely add paint strokes to the bottom of the balloon after they are blown up. 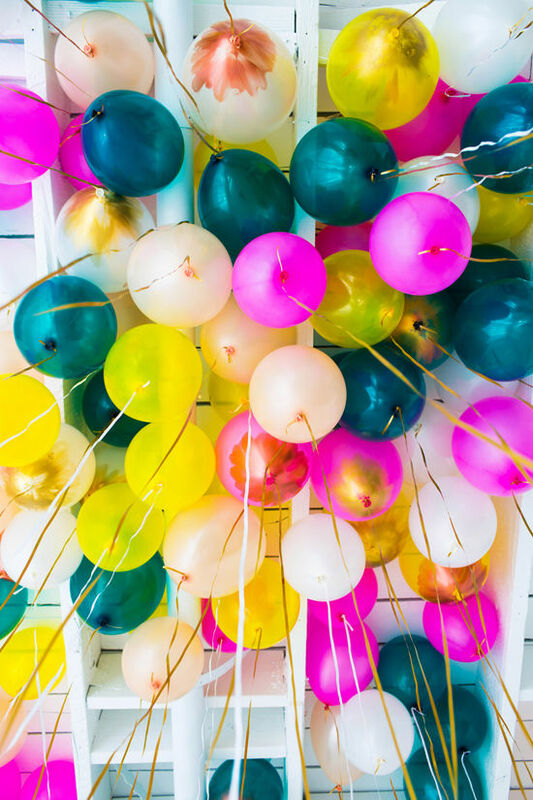 we got our balloons here, they have such beautiful colors. then we just tied them to a chair and let them dry before releasing them up with the rest. a funny fact: you may notice i am wearing headphones below. ha. 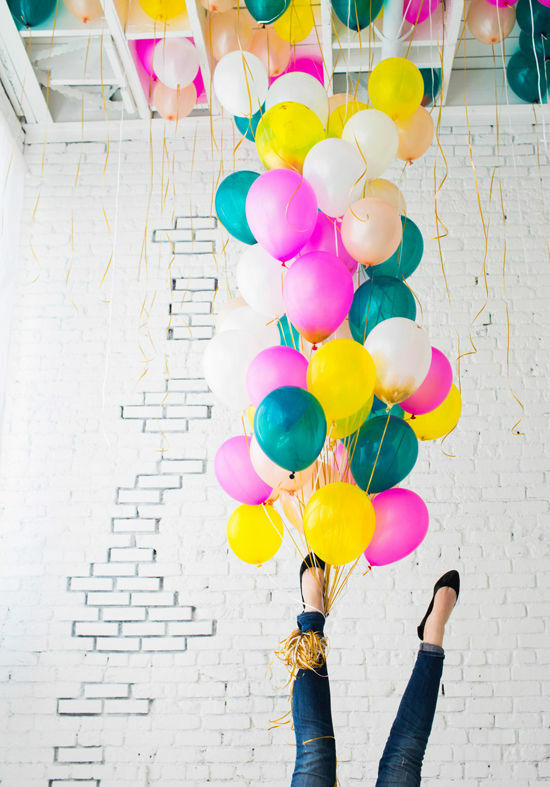 while i truly love balloons, i am SO afraid of them popping. so for this shoot we blasted loud music and i wore headphones for any casualties. this project came out so pretty! such a great way to add impact for not a lot of money. This is fantastic and I just love how simple it is. Great color choices, too by the way. Your “blank canvas” office space is making me rethink my idea of how I’d like my office! I LOVE your blog!!! The colors, everything!!! Gorgeous!!! Very inspiring!!! I love this idea! Especially the painted bottoms-what a fun twist! These are simple but genius. 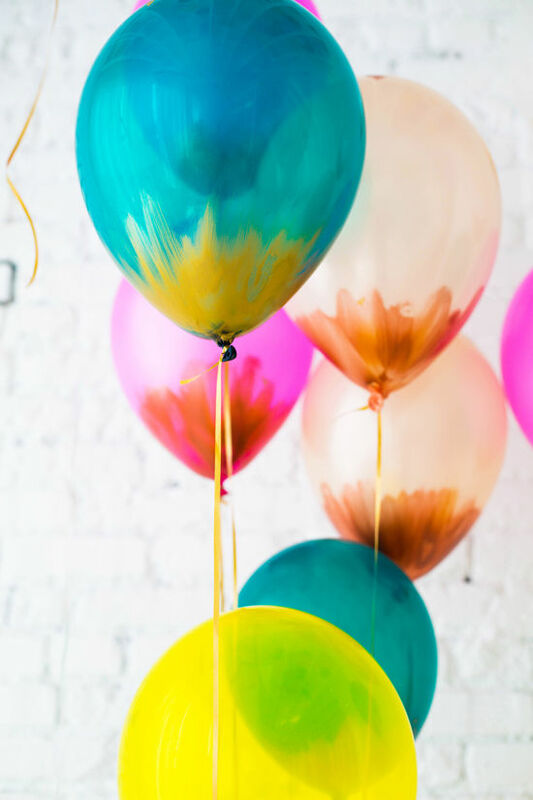 Totally smitten by these lovely balloons! 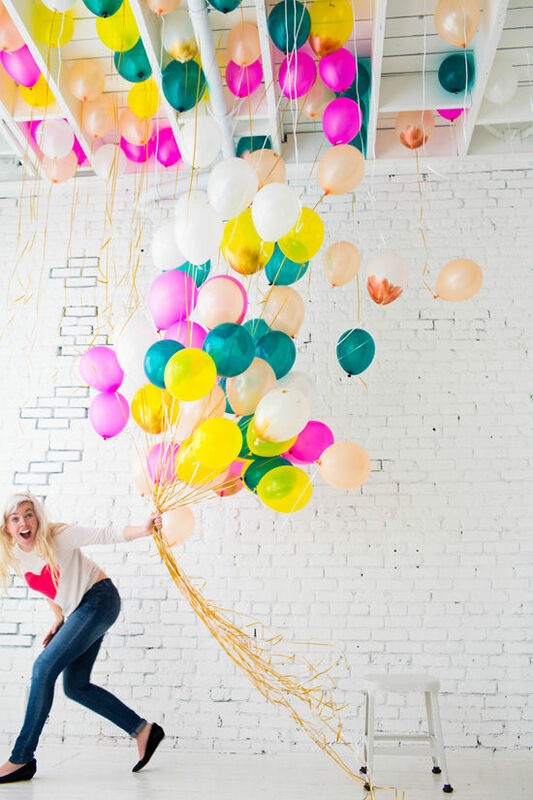 Beautiful photography and the shot of all the balloons tied to your foot…ADORABLE. What a fun idea. Great pictures as well. way too fun and light-filled as usual. my fave. also — definitely appreciating its simplicity! 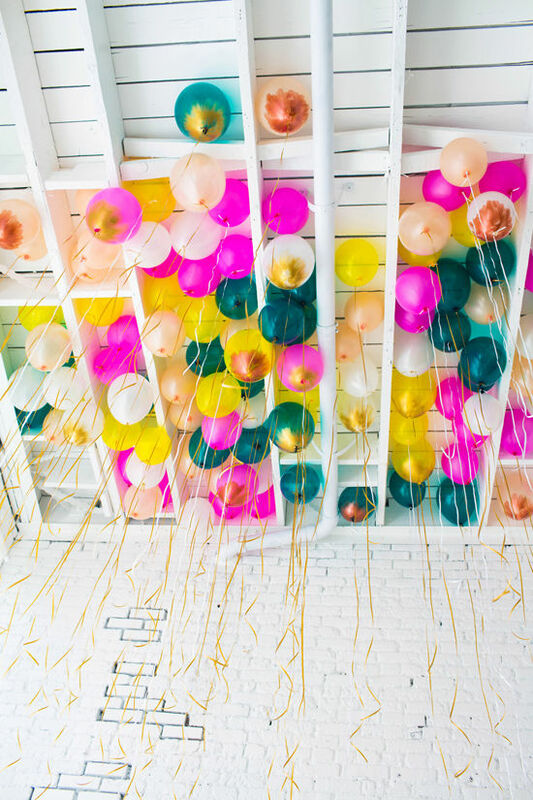 love a room full of balloons! 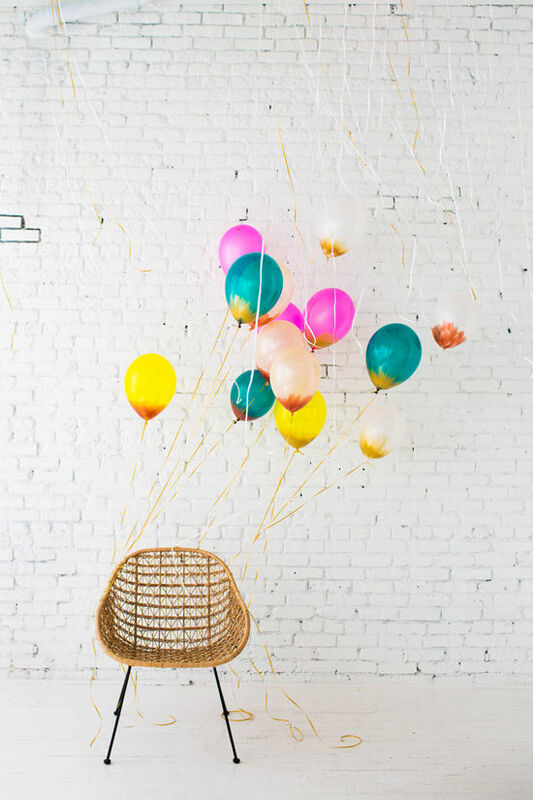 i’ve been looking for pink balloons in a similar shade – where did you find yours? my local party store only had baby pink. about to try some on amazon. Loveee this!! Those are so adorable. Also- what font are you using on your pictures? LOVE it! This is so fun, I’m so jealous of your space! Also, where did you get those shoes, I love them! Love the pictures. What a neat idea! Shoes…. Where are they from, please? 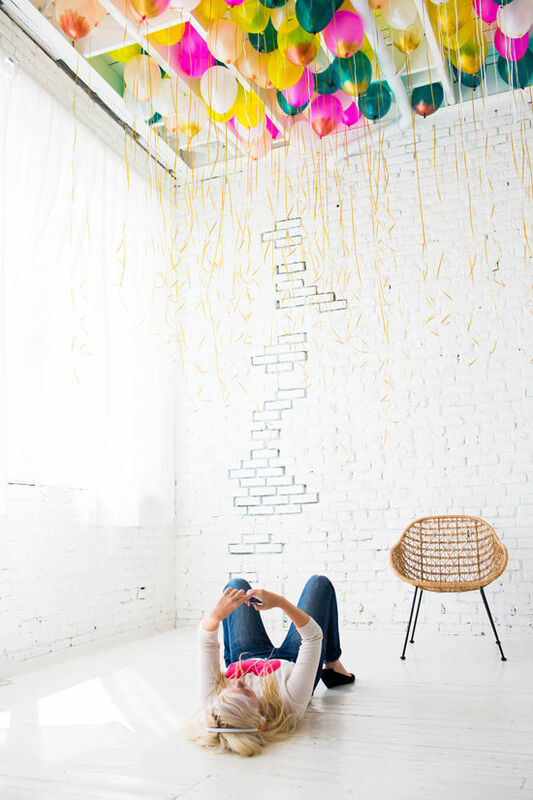 Where did you find that amazing rattan/wicker chair?! Such a great idea! Super cute! 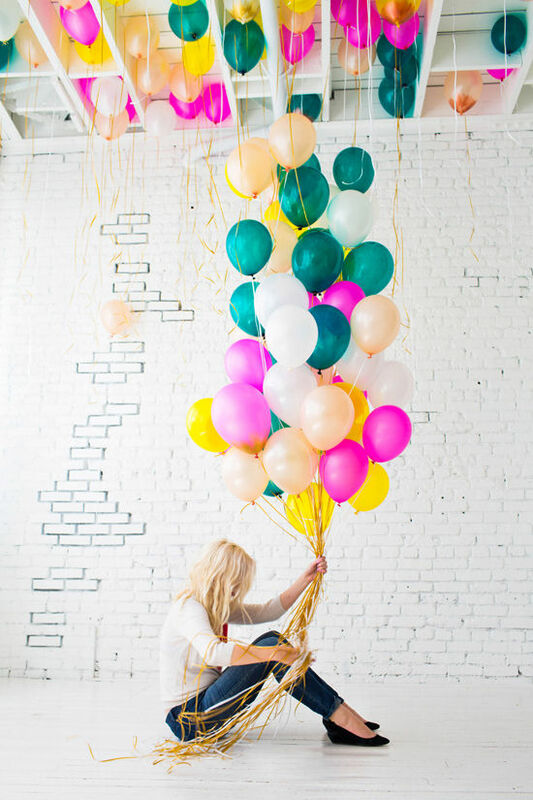 I just love the brightness of the balloons on the white! And the extra touch of copper & gold are perfect! Thanks for the great ideas! I’m in love with these images. Thanks for taking a simple idea and making it visually stunning! I’m in love with these colors! These photos make me so happy! I experience examine great number of internet sites and additionally gone through many websites,however your work is in fact superb.Hats off for the commitment in addition to credibility.Do hold us all advised at a later date as well. on your page at appropriate place and otrher person will also do similar for you. have a 4 percent lending on the apartment, the customer can presume your 4 percent mortgage. inflicting the problem. Stop or lower approach back on no matter activity you feel is perhaps triggering the pain. defined, keepp it up all the time. this before. So great to discover somebody with a few original thoughts on this topic. %Located in Madison Wi, Dora Hair Braiding Salon is the most paramount deal one can go for when it comes to African Hair Braiding. If their clients’ testaments are anything to go by, Dora Hair Braiding salon is the finest of its kind. for a similar subject, your web site came up, it appears to be like good. Extremely useful information particularly the final section 🙂 I maintain such information much. this website is genuinely fastidious and the viewers are in fact sharing fastidious thoughts. What’s up, after reading this awesome article i am as well happy to share my experience here with colleagues. %The GBC GSM128 Shredder ShredMaster Jam Free Series offers extra-intelligent technology. Shreds paper clips and staples. Also includes super-quiet operation, easy-to-use controls. to my followers! Outstanding blog and terrific style and design. Nice answers in return of this matter with genuine arguments and telling all on the topic of that. Wonderful items from you, man. I’ve bear in mind your stuff previous to and you’re just extremely excellent. I really like what you have acquired here, really like what you’re saying and the way in which through which you assert it. %Right outfit paired with fancy shoes, stack of accessories, stunning makeup, and a gorgeous hairstyle, are all important parts of the recipe for creating a look that make heads turn. Hi every one, here every person is sharing these know-how, so it’s nice to read this blog, and I used to visit this web site everyday. which she’d be caught up in the clouds to satisfy her Lord. training program you will certainly see results faster. To aid put on weight you could use nourishment standards to raise your caloric intake effectively. knowledgeables merely obtaining just fat. compressor items: R-12 makes use of mineral oil and the R-134a requires POE oil. Exercise can assist you obtain in form, lose weight and it could be enjoyable.